Ginseng was originally named “man root” because its roots resemble little people, with forks that look like arms and legs. Both the root and the leaves of this plant have benefits to humans, from antioxidant to energy-supporting properties. In skin care, ginseng is prized as an anti-aging ingredient because it has so many phytonutrients, and because it helps tone and brighten skin. This ancient Ayurvedic remedy may help reduce the appearance of your age spots. All types of ginseng are slow-growing perennial plants found in the northern hemisphere and in eastern Asia. Ginseng likes to grow in temperate forests, and has been used in Chinese traditional medicine for centuries. Considered an “adaptogenic” herb, it helps the body to adapt to the environment, deal with stress, and resist environmental damage. The roots are said to be slightly sweet and licorice flavored. They can be eaten dried, steeped to make tea, or ground into a powder for medicinal use. The Chinese have used the herb mostly as an energy tonic, as ginseng helps stimulate energy. Diabetes: Studies on American ginseng have found that it may help improve blood sugar levels. Weight control: An extract from the ginseng berry as well as ginseng tea have shown some potential in suppressing appetite. Stimulant: Ginseng helps athletes use oxygen more efficiently, and is believed to help increase energy levels. The tea has also shown some evidence of stimulating brain cells to help improve concentration. Menstrual cramps: American ginseng tea is said to help ease pain associated with menstruation. Sexual function: Korean red ginseng has long been used to stimulate male sexual function. Immune system: Some studies have found that Asian ginseng may help boost the immune system, especially when taken by older people recovering from an illness. Fatigue: In a 2012 study, researchers found that cancer patients who received 2,000 milligrams of pure ginseng on a daily basis helped participants feel less fatigued after 8 weeks. Ginseng is considered a strong anti-aging skin care treatment because of its reputation for rejuvenating the look of your skin. Like most herbs, ginseng also protects the skin from environmental stressors. We use ginseng in all these formulas for its many beneficial properties. Like so many natural ingredients, it provides a number of benefits that help all types of skin. Do you use ginseng for its energy-inducing or concentration benefits? Let us know! “Top 5 Health Benefits of Ginseng,” Newsmax, March 9, 2011, http://www.newsmax.com/FastFeatures/Ginseng-Signs-health-benefits/2011/03/09/id/371455. 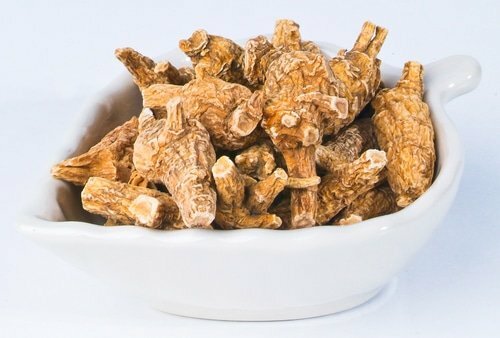 “Ginseng reduces cancer-related fatigue, study finds,” Fox News, June 5, 2012, http://www.foxnews.com/health/2012/06/05/ginseng-reduces-cancer-related-fatigue-study-finds/. Cho S., et al., “Red Ginseng Root Extract Mixed with Torilus Fructus and Corni Fructus Improves Facial Wrinkles and Increases Type I Procollagen Synthesis in Human Skin: A Randomized, Double-Blind, Placebo-Controlled Study,” Journal of Medicinal Food, December 2009, 12(6):1252-9, http://www.ncbi.nlm.nih.gov/pubmed/20041778. Yoshiyuki Kimura, et al., “Effects of Ginsenoside Rb1 on Skin Changes,” Journal of Biomedicine and Biotechnology, Volume 2012 (2012), http://www.hindawi.com/journals/bmri/2012/946242/. Young Gon Kim, et al., “Effects of ginseng sapponins isolated from red ginseng on ultraviolet B-induced skin aging in hairless mice,” European Journal of Pharmacology, Volume 602 (1), January 5 2009, pages 148-156, http://www.sciencedirect.com/science/article/pii/S0014299908011539.